This and all posts are always up to date. I’m always accepting new clients and try to never have a wait list of more than a week. If it’s ever longer than that, it will be posted on the site. To past clients, you may see some things here you didn’t receive. I’m constantly refining this process. I’m better at this now than I was 6 months ago, and will hopefully be better than I am 6 months from now. If there’s something here you don’t remember receiving, it may be I didn’t know of it at the time, hadn’t integrated it yet, or your situation didn’t warrant it. Quick advice on filling this out: Think of it like a first date. You don’t need to send me every detail you can possibly remember. Instead, we’re just getting to know one another. Usually every question can be answered in one to three sentences. I’ve had people turn this into a four thousand word response. That’s too much. I promise I will ask you for more information if I need it. It should only take 5-10 minutes to complete. I have the person first go over any current issue(s), then any past ones. When does it hurt? Be very specific. “During the day” isn’t sufficient. When during the day? What time of day? What movements? When during those movements? On a scale of 0-10, nothing to you’re ready to go to the emergency room, what’s your pain like? How long have you had the issue(s)? Anything you think makes you better? Why do you think this started? Are there any injuries in your past you feel are relevant? What’s your routinized life like? What are you doing on a regular basis? What’s your profession? Sitting in a chair 8 hours a day, commuting 2 hours a day, typing a ton, do you have kids, hobbies, etc? How do you feel about your current life? Are you content, distressed, on antidepressants, or anything else? If you’re having issues with pain, how has it affected your life? What position(s) do you regularly sleep in? Do you sleep well? Or is getting a full night’s sleep rare? How do you feel from an eating perspective? Are you content with your habits, feel you need to work on something, etc? Are you on any medication(s)? What does your current exercise life consist of? Exercises, sets, reps, times per week, etc. Be specific. “Legs 3 days a week” doesn’t cut it. Prioritize here. If your knee has been bothering you for 10 years that’s more important then wanting to see an extra ab. At the same time, if you have 50 pounds to lose and you’re prediabetic, being able to do any exercise is more important than an achey joint. A front, side, (other) side, and back photo. Make sure I can see everything from your toes to your ears. From here I decide on a couple things. First, is this someone I want to work with? Not everyone is a good fit. Second, is this someone I feel I can help? It’s rare I don’t think I can benefit someone, but sometimes I may suggest something like getting bloodwork done before I’m comfortable continuing. -> Rundown of the routine. -> Rationale behind the plan with links to: Why I prescribe the sets and reps that I do, why there’s no massage or manual therapy advocated, how much thinking to do during an exercise, how long to feel better, current things the person is doing which need to be eliminated, and other minor notes. -> If the person’s primary goal is something pain related, like shoulder pain, I’ll give a brief synopsis of what’s causing their issue(s). Using the person’s photos and videos, I’ll go over the primary movement issues and some quick anatomy of which muscles are at play. If I have something poignant I’ve written on the site, I’ll link them there as well. -> All ADLs aren’t covered immediately. Much like the exercises, which ADLs are focused on changes over time. If you’re someone who sits down 10 hours a day, we’re going to spend a lot more time initially talking about how you sit versus how you stand. Or if you have more pain when you wake up, gradually feeling better during the day, then we’re going to talk more about sleeping. You can only focus on so much at a time, but everything important is hit within 6 weeks or so. -> All the exercises for the month are listed with links to videos. Exercises are listed in order of appearance throughout the month. -> Videos usually contain voiceover from me with proper form cueing. I’ll also add text notes for things that person should specifically focus on. -> I make the exercises work for whatever equipment a person has access to. If you don’t go to a gym, that’s fine. We’ll make it work. -> Details of what to do every single day of the week are provided. ->Normally 6 of 7 days consist of corrective exercises. -> I always ask people to let me know if the schedule doesn’t fit with their life. We can always adjust. -> One day of the week is dedicated to only ADLs, along with visualization exercises. -> Sets and reps are provided, as well as progressions. “3 sets of 10” isn’t optimal. Some of this information can be found here: How many sets and reps to correct muscular imbalances? ->There is a mixture of days. I often give a few days where the exercises are done in a workout, circuit like fashion. Have 5 exercises? Do all 5, then repeat for the allotted number of sets. I also have days where the exercises are spread out. Three sets of three exercises for the day = one set of all three in the morning, one set in the afternoon, one set at night. -> The cruciality of this is based on the person. You have foot pain? This is going to be a more extensive discussion. Knee or hip pain? We’re going to talk about footwear (like I did here), but you can’t assume changing your shoes to Vibrams is going to evaporate all your joint issues. -> 3 supplements which can help alleviate joint pain. -> Which pain pills are beneficial, which ones should be avoided, and the timing of when something should be taken. -> Couple small items. Vegetables, fruit, protein levels, etc. -> Nothing is fancy or expensive. If a person took everything listed it may amount to ~$35 a month. Full info in this post. After the spreadsheet is sent the client and I go back and forth through email making sure things go smoothly. I ask the person to send me videos of them performing the exercises quite often in the beginning to make sure their form is on point. (It doesn’t have to be anything special. If you have a phone, you can usually place that next to something, hit record, and that’ll be good enough.) Any problems or adjustments needed as time passes are accounted for as well. I try to get back to people within 36 hours, but with weekends and me traveling this isn’t always guaranteed. 48 hours is a very good bet though. Because of factors like this, and the fact people are often doing things they’ve never done, I start with very little. Week 1 I give no more than five exercises, Week 2 another 2 or 3, and Week 3 another 2 or 3, for a total of no more than 10 exercises the first month. This is more than enough for anybody. Most people don’t nail the form of the Week 1 exercises til at about Week 3. The hope is as someone is starting to get comfortable with one exercise (they’ll do it 3 times a week -give or take), I add some more. Lastly, per the order of the spreadsheet, the ADLs are more important than the exercises, and they often are an exercise in themselves. Therefore, most people are doing new “exercises” all day, everyday. One of the common themes in my email inbox is people searching for one exercise. Everyone thinks there is some holy grail. That one stretch they’re missing. That one muscle they haven’t been attacking voraciously. Based on how extensive all the above is -hopefully- this gives some insight into how things aren’t that simple. Exercises / stretches are important, but the principles behind what’s causing a person’s issue is what’s most crucial. Every single thing detailed on the spreadsheet revoles around that. It’s not one exercise that matters, it’s the exercises, the technique, how you sleep, sit, stand, walk, etc. There’s a lot to consider. “Can you do it at home?” The more of this you can do at home, the easier it is for one to do, the more likely you’ll stick to it. Gradually increase duration and intensity. Another reason to start off with a small amount of exercises. Social support: For our ADLs, I often advocate getting friends or family involved. Always lean to the right? Get your spouse to help you notice this. Also, by hiring someone you right away have somebody to talk to and understands what you’re trying to accomplish. Based off what day of the week it is one is going to be able to adhere to the schedule differently. For example, sometimes people do better adhering to 3 mini workouts a day compared to one long workout. When do people have trouble adhering to exercise? On the weekend. So, when do we have people do short, multiple workouts instead of one longer one? The weekend. Have a goal: One of the first questions I ask clients is their goal(s). You always need something to strive for. Get routinized: I’m not sure one could have more of a routinized plan than something like this. Literally everyday of the week is spelled out. No pain: Anything that hurts you is, naturally, not something you want to stick with. I’ve heard many physical therapists go, “We’re going to need to put you in pain at times.” Phrases like this make my head want to explode. Other people have issues that just take longer. 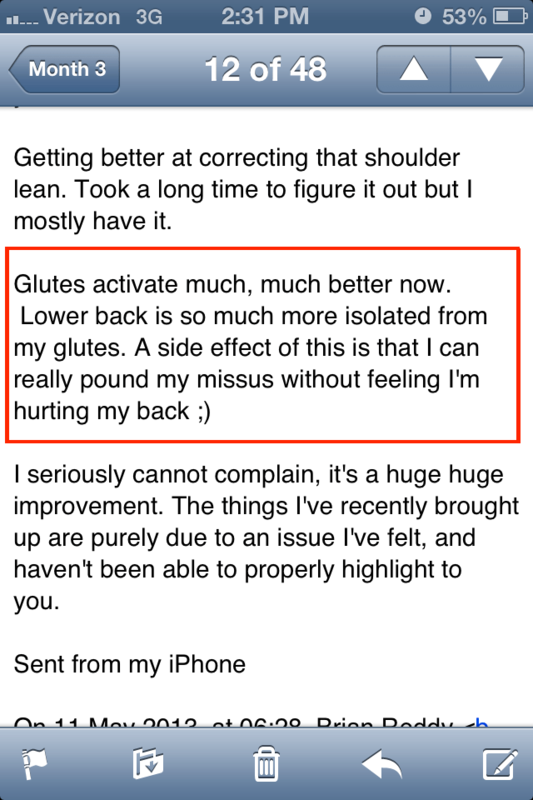 If you’ve had a fucked up lower back for 20 years, I can’t guarantee you’ll feel wonderful in just a month. 3 months? Ok, that’s better. Then there is the aspect of this being a remote process.. Things can take longer when I can’t see you in person. 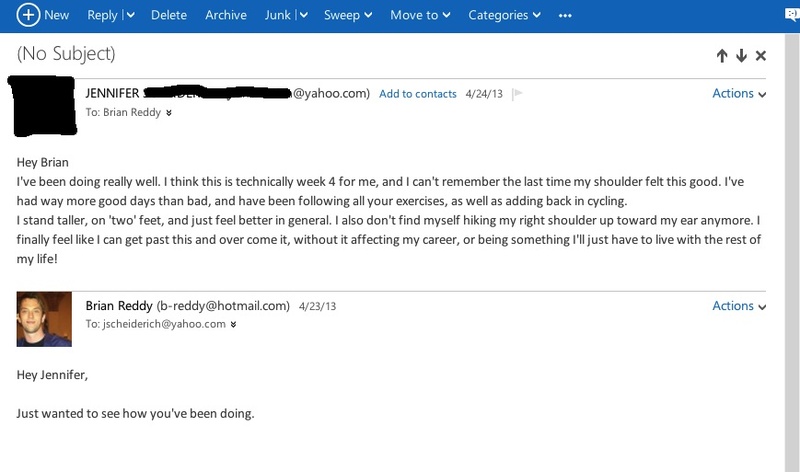 If you only email me videos of your form once every few weeks, it may be 3 weeks til I catch you doing something wrong, which may be setting you back. However, I’ve had some pretty good success with people doing things this way. Maybe it takes a bit longer at times, but progress is better than the alternative. For a more technical discussion on this topic check out this. I’ve been doing really well. I think this is technically week 4 for me, and I can’t remember the last time my shoulder felt this good. I’ve had way more good days than bad, and have been following all your exercises, as well as adding back in cycling. Some more general testimonials can be found here. Interested in working together? 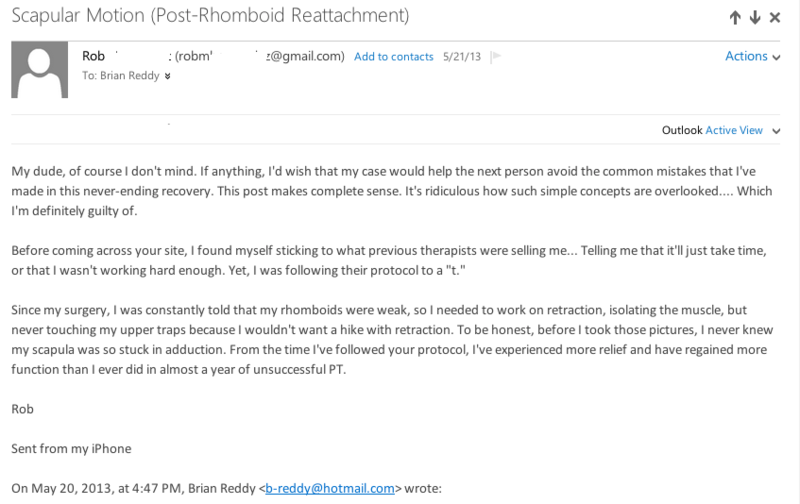 Email me: b-reddy@hotmail.com and we’ll get the ball rolling. ← How many reps and sets to correct muscular imbalances? Great post! You have time to get an old friend/client back on track! Hope Canada is treating you well. I have to give you props, this is a great resource you have here, very interesting and written in an easy-to-read manner. Still in regards to the remote client process, I have to ask the obvious – How much do you charge your remote clients? Thanks for the nice comment. I do all pricing stuff through email. I’ll shoot you one in a minute here. I do have it listed in the services section, but it doesn’t exactly jump out on the page. I do that on purpose :). Hi there, Brian. I’ve stumbled across your blog 2 years ago, and I still follow your blog. Thanks a lot that your serve all over the world. Great gesture. I’ve discussed about your blog with my Physio and Orthopedic friends. You made medicine look so easy and reachable. Thanks again for your energies and I wish you a good and fulfilling life ahead. Ironically, I’m Reddy too. But, entirely unrelated South-Indian Reddy. Thank you for the nice words RK! I’ve had many Indian friends ask about my last name. Still as far as I know, no Indian heritage for me :).